I spent some time cleaning up the vegetable garden earlier today. A slight breeze rustled through the last of the corn stalks as fallen leaves from the nearby grape vine danced across the garden. The remnants of tomatoes I never picked hung from the frost-blackened vines. I worked crop by crop, pulling out the spent plants and piling them on to the compost pile. The sky was blue and I marveled about how nice a day it was, a good day to spend in the garden, reflecting on the past and remembering how I learned to garden. My Dad first showed me how to plant a vegetable garden by his example. I helped him plant peas, lettuce, onion sets and radishes early in the spring. I followed along as he set out tomato plants and sowed green beans in mid-May. I remember how he always added some flowers for color, usually zinnias and marigolds. He kept the garden weed free, but never made us kids weed for him, so I never thought of gardening as work. He harvested regularly and cleaned it all up in the fall so he had a blank slate to plant all over again in early spring. Today, nearly a quarter century after my Dad passed away, I think of him every time I step into my vegetable garden and I still plant my garden in much the same way that he taught me. Many people talk about memory gardens, planted purposely in memory of someone close to us who has passed way. That is what my vegetable garden has turned out to be, though it wasn’t intentional on my part. I planted it to be a vegetable garden, but then through the years I realized that it has turned into a memory garden. It isn’t just about growing food – it is also about remembering my past and my Dad. This spring, I will plant a memory garden for my Mom, who passed away last week. It will be filled with violets, her favorite flower. If the violets spread about the garden or yard, that will be fine with me. Violets will never be a weed in my garden. How could they be? 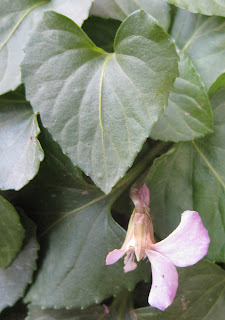 My Dad used to let us dig wild violets from the woods and bring them home to plant in our garden because my Mom liked them. I’ll plant a lilac, too, as fragrant as I can find, one that will bloom around Mother’s Day. I’ll also add some Lily of the Valley from a clump I have that I got from my aunt, who got them from my grandmother. It won’t be a large garden. I'll tuck it away in a corner somewhere. Others may see it and not even realize the memories it holds. I won’t have to look up anything in books to figure out how to plant this garden or how to design it, either. There will be no need of that. I’ll plant it by what is in my heart, by memory. That's a great idea, and a wonderful way to keep your mom always with you. People used to just plant a tree to remember someone, but I like the idea of a special little garden instead. Such a touching tribute, dear Carol. I know your parents would be so proud of these gardens, too. I'm sorry for your loss. My Mom passed about just about three months ago and I've started a garden in her memory. It helps, a little. Carol, I'm sad to hear of your mother's passing but my heart fills with joy as you celebrate her life and your own as well, as you remember both your parents in your garden. Your garden is a place that brings you and others, like me, who connect with you through your garden, great joy. May you continue to have lovely memories of those that have gone before you, keep the past close to your heart, and continue to connect others, as you do so well, so we all may rejoice in the joy of gardening. H.
I'm so sorry to hear of the loss of your mother, Carol. This is a lovely tribute to both of your parents, and I can think of no better or fitting way to keep their memories alive than through your gardens. Beautiful post....you do them proud. Carol, my heart goes put to you. The people we love live on in us, and sometimes in our gardens. I'm grateful to have garden memorie of both my parents, and i found your post ivery moving. Sorry for your loss Carol. I assumed the beautiful woman on FB was your mom and should have guessed. I walk through my father's garden on more of a weekly basis since I have moved next door. There are certain plants in there that bring him to mind. Then there are the roses I planted for him on his last Father's Day on the hill behind the roadside vegetable garden. Gardens are good for memories. When I pull the final dregs of the marigolds from the garden in the fall, I think of Dad who always had them. I love a 'violet' memory garden. You must have some of the Viola odorata in that garden. They smell uniquely sweet. What a lovely tribute to your parents, Carol. I'm certain they are proud of you...and I'm so glad you have such a wonderful place to sit and think of them. Your parents will always be with you in your garden and in your heart. So sorry to hear about your loss Carol. Big Hugs. Carol, I'm so sorry to hear about your mother. My deepest sympathies to you and your family. And of course you would plant violets. I love that they will spread all over the place, just as her love for you has done over the years. What a beautiful reminder. Hugs to you. Carol: I'm sorry for your loss. It's so sad to lose your mother. When my Mom passed away 20 years ago I promised myself that one day, when I had a house and yard, I would plant David Austin's "Mary Rose" shrub in her honor (my Mom's name was Mary Rose). Now that I do have a house and yard, I have planted "Mary Rose" in my shrub border and she is thriving. During the growing season, as I enjoy the lovely, fragrant, soft pink blooms and tend to "Mary Rose" I smile and remember my mother. I know that your new Violet Garden will bring you happy memories, too. I am sorry to hear about your mother. Those of us who had parents that passed down a love of gardening are the luckiest people on earth. What a beautiful post, Carol! I'm so sorry to hear of your lose. I have many plants in my garden that are memory triggers - remind me of people who influenced my love for gardening or events that brought me to where I am today. May your violet garden bring you peace with your mother's passing and always remind you she is with you and watching over you. I'm sorry for your loss. My mother passed just after Mother's Day. My mother was from NYC. When we moved to Seattle, she fell in love with Rhododendrons, Japanese maples, and the Japanese influenced gardens common here at that time. My preferred garden style is a bit more complex than Mom's, but it is based on trees and shrubs like hers. Aren't most of the gardens non professionals plant memory gardens in the sense that they are influenced by the people and places we've known? (Now I've got John Lennon's My Life running through my head). Please accept my condolences. I know how difficult it is to lose a parent. My mother, an avid flower gardener, died in 1997. I miss talking to her about gardening. It's such a nice tribute have a memory garden with her favorites. My father was the veggie gardener in the family, as was yours. I remember he was so driven to keep his garden weeded and watered. When there was a drought, he would carry buckets down the hill next to his property to a spring in the woods, and then back up the hill. He did this over and over again till he had the garden watered, and it was a huge garden. He's gone now and I miss visiting and hearing him talk about what he planted and how the plants were doing. What a lovely post - and I'm so sorry for your loss... I'm sure your memorial corner will be lovely. My mother died over 10 years ago, but she's still very present in my garden; I've still got plants she gave me, and some I took as cuttings from her garden. Following my grandfather's example, perhaps - he had three holly trees which started their life as cuttings from the funeral wreaths of his young wife, my grandmother. And I've got a holly from the same source - these things can go on forever... Very best wishes. Memory gardens can be so meaningful, and I like how you have described what both of yours mean to you...and that one didn't even start out with that intention, but you know that that is exactly what it is. Whether veggies or flowers, if they symbolize the beloved in some way, that's what's important. I am sorry for the loss of your mom, Carol. But I'm glad you have a special place to reflect and remember her.